In spring and summer, feed with a high nitrogen organic fertiliser. Fertilize more if you see yellowing leaves. Yarrow, Thyme, Marigold, Borage and Calendula. Lemons and other citrus are heavy feeders that resent close company. Set out new plants in spring. Grow in containers of rich compost to keep plants compact and to make it easy to move plants when needed. Good drainage is essential. Start small plants in containers at least 30cm (1ft) wide and pot them up a size yearly until they reach mature size. Prune in spring or summer to shape plants, and watch for thorns. 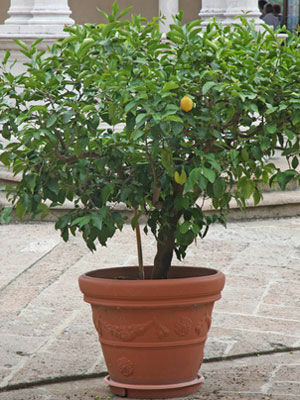 The ‘Meyer’ lemon is easier to grow than other types. Soft soap sprays can help against scale insects and mealybugs.